The United States Hydrocolloids Market to Reach US$3 Billion by 2024, Owing to Robust Demand from Oil & Gas and F&B Sectors – Market Report (2018-2024) by Industry Experts, Inc.
Industry Experts, Inc. released the new market research report “The Americas Hydrocolloids Market – North America & South America“. This is another regional market report under the series of global Hydrocolloids market research reports. Growth in the North American hydrocolloids market is anticipated to driven mainly by increasing demand from oil & gas sector, as well as food & beverages. Increasing oil drilling activities in the United States and Canada is forecast to drive the demand for hydrocolloids in North American region. On the other hand, South American market is mainly driven by increasing usage of hydrocolloids in the food & beverages sectors. Food additives are becoming a necessary part of food and beverages industry and natural clean label food additives such as hydrocolloids penetration is on the rise. The hydrocolloids industry is forecast to receive an impetus from this booming demand. The United States dominates the region’s market for Hydrocolloids, estimated at US$2.3 billion in 2018, which is projected to reach US$3 billion by 2024 to reflect a 2018-2024 CAGR of 4.1%. 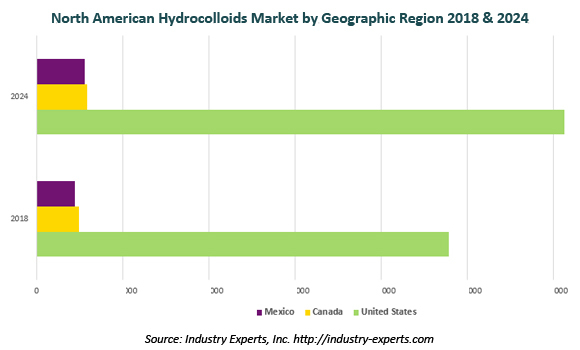 North American market for Hydrocolloids is expected to reach 596 thousand MTs in 2019. This market report analyzes hydrocolloids by raw material source comprising Animal-derived, Microbial-fermented, Plant-derived, Seaweed-derived and Cellulose-based. The report analyzes the Americas (North America and South America) market for hydrocolloids by individual hydrocolloids types consisting of Gelatin, Xanthan Gum, Gellan Gum, Guar Gum, Gum Arabic, Locust Bean Gum (LBG), Tara Gum, Pectin, Agar-Agar, Alginates, Carrageenan, Carboxymethyl Cellulose (CMC), Methyl Cellulose & Hydroxypropylmethyl Cellulose (MC & HPMC), and Microcrystalline Cellulose (MCC). The study also analyzes the key end-use applications of hydrocolloids including Animal Feed, Food & Beverages, Pharmaceuticals & Healthcare, Cosmetics & Personal Care, Oil & Gas and Industrial/Technical applications. Americas markets for the above-mentioned hydrocolloids raw material sources, types and end-use applications are analyzed both in terms of volume in metric tons and value in USD. The report reviews, analyses and projects the Hydrocolloids market for key regional markets in Americas for the period 2015-2024 comprising North America – the United States, Canada and Mexico; and South America – Brazil, Argentina and Rest of South America. This 352 page Americas hydrocolloids market report includes 309 charts (includes a data table and graphical representation for each table), supported with a meaningful and easy to understand graphical presentation, of the market. The study profiles 70 key market players and also the lists the companies engaged in research & development, manufacturing and supply of hydrocolloids in the Americas region. The regional list of companies covers addresses, contact numbers and the website addresses of 92 companies. California, USA based Industry Experts, Inc. is a multi-industry focused market research provider.